A couple of weeks before this, I was posting more frequently. This not because I had more time, but that I had finally created a “system”. I’ve figured out that it’s easiest to create posts in separate steps instead of doing it all in one sitting. I’ve found that what works best is if I take the pictures when I first get the products, then type up the bodies on another day. Then, on another day, I throw it all together. That’s basically what I had been doing my last couple of posts, and I think this process really helps. I’ve actually had the pictures for this unboxing since I first got the package in the mail, which feels like it was ages ago, but I haven’t taken the time to type up the post because I find it takes me a REALLY long time. But despite this, I’m here bringing it to you today. 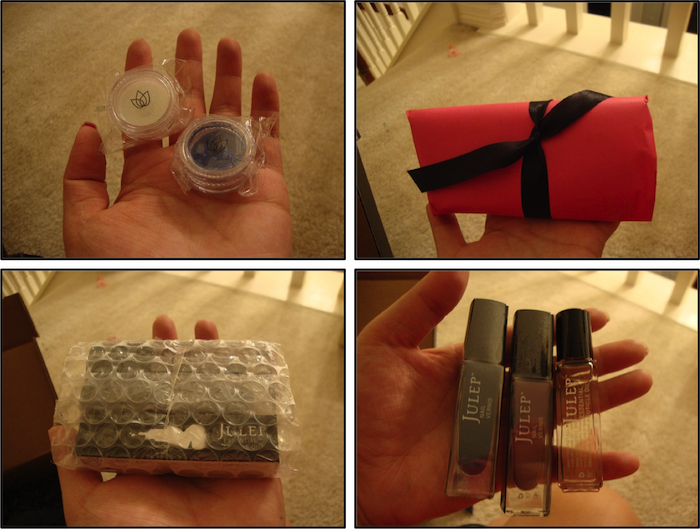 Because this was my first Maven Box, or “starter kit”, I only paid $4.99 excluding taxes and shipping. At first this is deceiving because I got an email saying that I could get my box for 1 cent, which is why I first decided to get a subscription. Granted, that was too good to be true, but paying a little over $5 is better than the usual $20. With all that being said, if I had an actual job, I wouldn’t mind paying the $20 because you get a decent amount of products. Once again, if you follow me on Instagram, you’ve already seen the products that I’ve gotten, but here are some individual pics. When I originally paid the $5, I thought I was getting the two polishes plus the cuticle oil, so I was surprised to find the two glitter pots. All in all, I’m very happy with my purchase. 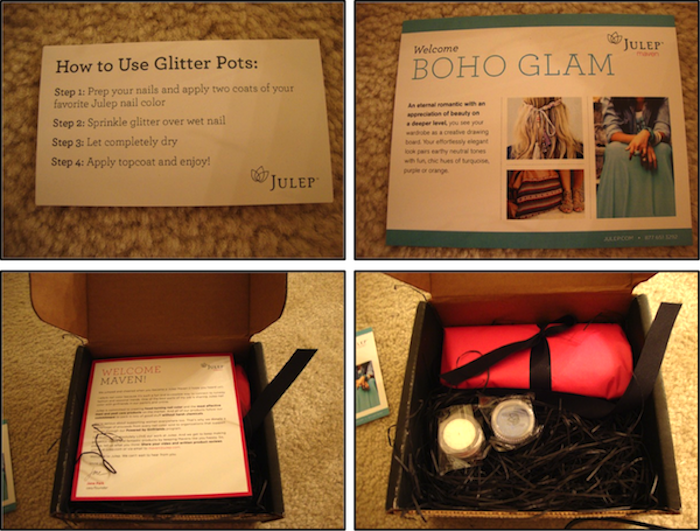 I love the colors, and I love the flexibility of Julep Maven boxes. I think it’s pretty cool that you can choose certain sets, or that you can even gift them if you wanted to. The brown-taupe-ish color looks better in person. It’s actually more mauve-y. In this picture, the navy looks black, but in better lighting, the color is true. These are easily the nicest polishes I’ve ever used. They are nice and creamy and go on beautifully. Also, the brush isn’t too thin or too thick and it makes application much easier. I really do love these polishes. After getting these, I’ve been wanting to get more, and hopefully, I’ll be able to soon! Once again, I wanted to say thanks for stopping by my blog and if you’re a Maven, let me know which colors you’ve gotten and which ones are your favorite!